Sometimes, all it takes for a great work to exist is to just take someone else’s idea and run wild with it. Entire film franchises exist based on other people’s works, such as Sherlock Holmes or the various monsters utilized by Universal in the mid-20th century. In the case of Die, the book fascinatingly takes from works of fantasy, even the 1980s Saturday Morning Dungeon & Dragons cartoon, and plays with a lot of recent themes found in Japanese fiction. Specifically, the “awakening in another world” concept, and wonders what happens to those characters after the books (or cartoons) end. 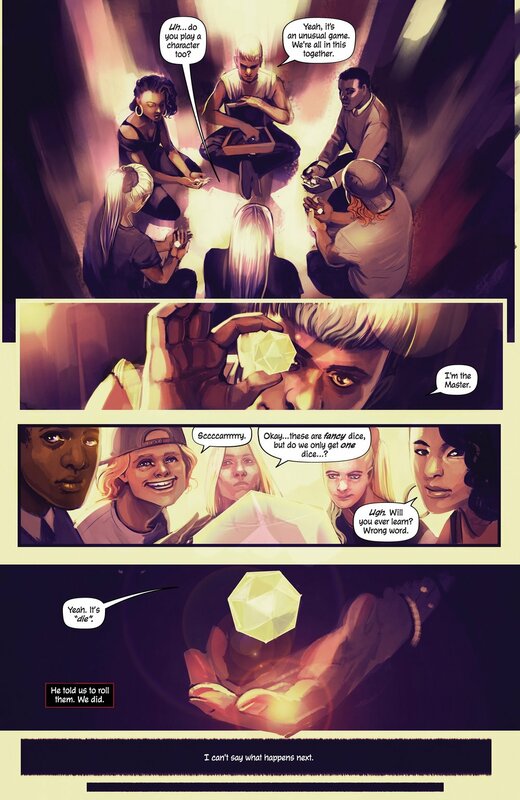 Written by Kieron Gillen, with art by Stephanie Hans and lettering by Clayton Cowles, all three seem to have at least a fair amount of fun with the setup. Particularly Gillen. Back in 1991, the story’s narrator Dominic and his sister Angela are celebrating their sixteenth birthday. Invited to their mutual friend Solomon’s house, they and three other friends are introduced to a new “adult” fantasy game by Solomon himself. Once each receive a standard D&D die variant, everyone vanishes. Reappearing two years later, time has worn on them all. Solomon has gone missing, Ashley is missing an arm, and no one can talk about what happened. Now the modern day, Dominic lives a broken life, haunted by whatever unspoken event occurred during that two year gap. However, a random birthday present shows up: Dominic’s d20 die from that game, covered in blood. Now all five of the remaining group reunite to try and see if their friend can be found and if he’s alive. Kieron Gillen isn’t very subtle about the twist hiding within Die. However, despite the generic “a group of friends are taken to a fantasy world” premise, where this story shines is what happened once the adventurers came home. Dominic’s trauma is implied beneath the surface of the text, but comes across incredibly plain in the execution. Chuck, the party animal from back in the day, coped by turning his trauma into books and movies, and is a great contrast to everyone else. Character dialogue also feels natural and fantastic, with the times focusing on the teenagers actually feeling natural for the early 1990s. In all, it’s a very fascinating concept, and well worth reading for this alone. The art for Die is nothing short of stunning. Stephanie Hans has some wonderful body language, capable of showing years of emotion in a single image, even with the dialogue ignored. Colors are vibrant during the flashback, but become dull and harsh during the modern day sequences. Even a simple page of ‘mom checking on the kids’ becomes a wonderfully-crafted piece of art, worth looking over multiple times before moving on. When the story does eventually move to that twist of the fantasy world, the designs are perfectly wonderful. Unique and powerful, each character holds an iconic look about them while all looking like they belong to whatever world Gillen is crafting. While the writing is fantastic, the art matches it equally. While the story is only beginning, the opening of the book examining how much a normal person can become messed up from such an adventure is amazing. Great writing and beautiful art, this is worth checking out without waiting for issue two.